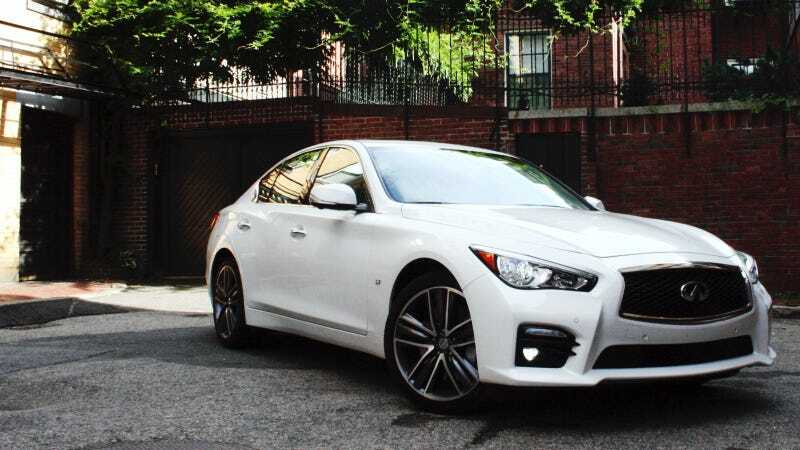 The first thing you need to know about the all-new 2014 Infiniti Q50, the eventual replacement for their G37 sedan, is that they got rid of the clock. I'll give you a moment to let your shock set in. The small analog clock, a mainstay in nearly every Infiniti since the brand launched in the early 90s, is gone. It has been replaced with an app that displays a clock on one of the two center-mounted touch screens. The loss of the clock in favor of an app says more about the Q50 and where Infiniti is going than you might think. To be fair, the Infiniti JX sport utility is also clockless. But if just about any other automaker ditched a similar time-honored tradition, there would be outrage. Apoplectic fans would take to the streets and the car forums, and their furor would only be quelled when their hands were red with the blood of the people responsible for this sacrilege, this desecration of something they hold so dear. Problem is, this is Infiniti we're talking about. In their 24-year existence, they have failed to establish a cohesive brand identity for themselves beyond "Really Nice Nissans," and where has that gotten them? Perennial also-ran status in the luxury game, that's what. Why should anyone miss the clock when Infiniti never really mattered that much? Starting with the Q50, Infiniti hopes to change that perception once and for all. The brand is in the middle of tumultuous change that has included hiring former Audi of America president Johan de Nysshcen to oversee things, becoming the title sponsor for an F1 team, incorporating in Hong Kong away from Nissan headquarters in Japan, launching a slew of new models including a compact based on the Mercedes CLA platform we'll see later this year, enlisting Sebastian Vettel for guidance, and renaming all their cars so they start with the letter Q. The Q50 is the first step in a plan that Infiniti hopes will eventually establish them as a top-tier luxury brand, and one that is very separate from their corporate parent. (The Infiniti people don't even like to utter what they call "the N-word" these days.) It's definitely an ambitious plan, but Infiniti admits achieving top-tier status won't happen overnight. That's why a lot is riding on the Q50. The G35, first launched in 2002, has been the brand's biggest success to date. Combine the sedan, coupe and convertible, and the G currently accounts for more than 40 percent of Infiniti sales. This is their bread and butter, and they have to get it right. They say it's the best sedan they've ever built, and after a few hours this week driving some pre-production prototypes in New England, I agree that that's probably accurate. So what is this reborn Infiniti supposed to be about now, anyway? BMW is the performance luxury brand, Audi is the stylish luxury brand, and Mercedes is the luxury luxury brand. Cadillac is transforming into America's Audi or BMW, and Lincoln is becoming America's Acura, and not in any good way. Infiniti hopes that starting with the Q50, they can become the sort of "performance and technology" luxury brand. And appropriately enough for a car that shares a name with James Bond's gadget guru, the Q50 is loaded with technology. Technology for entertainment and navigation that mimics your smartphone; technology for integrating with your actual smartphone; technology for going faster; technology to help you park; technology for achieving better fuel economy; and technology for keeping you alive on the road, or at least, for helping you compensate for the fact that you're a poor and inattentive driver. So did they achieve the "performance and technology" goal? One more than the other. As you move the steering wheel, a sensor reads the angle change, and then the ECU calculates the required tire movement. A "steering force actuator" then sends a sensation through the wheel so you don't just feel nothing. The idea is to filter out things Infiniti says you don't want in your steering, like too many vibrations or what they call "dirty noise." And there are various different settings for it depending on what you want it to do. So how does it work in practice? It's, well… interesting. It's different. It's remarkably precise, and it requires very little effort when steering in the standard mode. I'd say it's better than your average bad electric-assisted steering system, and it transmits more vibration and road feel than I thought it would, but it still feels overly artificial. Turning it to the "sport" setting adds a decent amount of weight to the steering, but then it still feels kind of cold and digital, rather than a fine-tuned instrument like a proper sport sedan's steering should be. It feels like I'm being told the computer's version of what the road is like and what the car is doing, rather than what it actually is. Like I said, it's better than the soulless robot-car steering I was expected, but if I had this as an option, I think I would come to hate it eventually. Its goal is to divorce the driver from the road, and it succeeds. Can such a car really be called a driver's car? On the outside, the Q50 sports an attractive and very modern design that carries over many of the nature-inspired, flowing lines we've seen in earlier Infinitis like the JX. It is lower and wider than the old G was, and it has a nice aggressive stance that I liked. On the other hand, it doesn't really stand out. From the front it looks a bit like a Lexus GS, from the side it looks like a cross between an F30 3-Series and an Altima, and from the back it really, really looks like the new Mazda6. It doesn't look bad, it just isn't distinctive. Moving inside we find an cabin that is plush, comfortable and uses quality materials, but maybe too conservative. It's a bit boring compared to the cockpits in the new Lexus IS and the 3-Series. However, it is functional and easy to navigate, and sports not one but two touch screens: an 8-inch top screen for the nav and a 7-inch bottom screen for the app suite that controls climate, driving settings, audio, and about a million other functions. Laid out like a list of apps across several screens like your smartphone, rather than a system of menus, the infotainment system works well and is one of the more intuitive ones I've encountered. A plethora of settings can be customized to fit multiple drivers, like profiles on a shared computer. Dumping the analog clock for an app suits the character of the car. The Q50 boast apps out the wazoo, including apps for Pandora and iHeartRadio, an app that reads Facebook updates to you and let you post your own by voice, a Yelp-style app that searches for stuff around you, and an app that tracks the car's performance metrics a la the GT-R.
And if you're not a fan of touch screens, there are redundant buttons and switches all over the car that replicate most of these functions. That's a nice addition, and one that will hopefully cut down on distracted driving. Speaking of driving, two available engines make that happen: a revised version of the ubiquitous and carried-over 3.7-liter VQ V6 engine with 328 horsepower and 269 pound-feet of torque, or a hybrid electric 3.5-liter V6 that puts out a hearty 360 combined horsepower. I sampled both the hybrid and non-hybrid engines, the former with rear-wheel drive and the latter with all-wheel drive. You may demand my Jalop card after you read this, but I liked the hybrid version better. It's seamless in its transition from electric to gas, and it can run on pure EV mode at low speeds and on the highway. All it really does is add a bunch of power and improve fuel economy, and if you turn off the energy display menu on the screen above the steering wheel, you never know it's there. It's the least hybrid-y hybrid I've ever driven, and I mean that in a good way. Zero to 60 mph times are estimated to be in the mid-to-low 5-second range, and the VQ has a lot of grunt on the highway, even if the non-hybrid version is a bit weak in the low-end torque department. Infiniti says their engineers have worked to make the car quieter than it has ever been, and they succeeded. You never really hear the motor unless you get on it. Fortunately, they have tweaked the infamous sound of the V6, and now it's a lot more growl and a lot less honk. It's never sounded better, but I just wish I could hear more of it. What Incredible Car Sounds Like Crap? Sadly, at least for right now, the replacement G does away with the old car's six-speed manual option. Infiniti implies that one will be offered eventually, but at the moment Q50 drivers get one option, and that's a seven-speed automatic with paddle shifters. I can't really say I was a fan of the slushbox. Downshifts are only moderately quick, and upshifts take even longer. The car never feels terribly sporting with this transmission, especially since the paddles don't move with the wheel and the manual upshift/downshift is the incorrect "up for up, down for down" layout. If you want to have some fun, wait for the manual. Among the tech systems designed to keep you from murdering yourself are a novel type of radar-based cruise control that actually looks two cars ahead of you before warning of a potential collision. It also has one of the more pro-active lane departure warning systems I've encountered, beeping at every possible moment. Then there's the one that keeps you in your lane by automatically correcting the steering in straight lines and around corners. When that kicks in, it's like a ghost hand on the steering wheel, guiding you to where you should be. It's kind of creepy in a way, and after I had my fun with it, I kept it turned off. I like driving my own car, thanks very much. Thankfully, most of these options can be deactivated, and the car offers a tremendous level of customization for the driving experience. But the Q50's biggest problem is that unfortunately, it's just not that much fun to drive. On paper, it should be. It's got plenty of power. It handles well enough, staying flat and keeping body roll to a minimum during back road shenanigans. The issue is that this isn't a car that makes you ever want to engage in back road shenanigans at all. Sure, it looks cool, it's rather nice to sit in, it's remarkably well-equipped it's and a dream sedan for any gadget lover. But due to the lack of low-end torque, the unwilling-to-perform automatic gearbox, computer-simulated sport steering, its too-quiet engine, and maybe even a lack of soul, the Q50 is never going to be a car you look forward to hooning. It's not a car that makes you want to take the long, twisty way home from work. Infiniti nailed the tech. They just didn't add enough testosterone.